Rent prices in Cape Coral, Florida, are up nearly 24%, according to RentRange. Families are facing much bigger rent checks this year -- especially those living in cities in the South and West. Rent prices have been rising across the country, but rents for single-family homes in these two parts of the country increased the most in the last year, according to a report from RentRange. "The biggest increases were in the areas where the [housing] market was most depressed," said CEO Wally Charnoff. 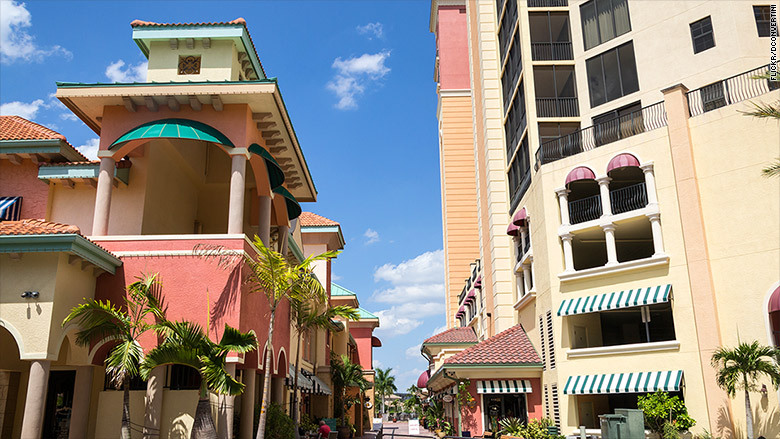 The steepest rent hikes were in Cape Coral/Fort Myers, Florida, with the average rent increasing nearly 24% in the third quarter, compared to the same time last year. In Sacramento, rents went up almost 18%. Seven of the top 10 cities with the largest rent increases were in Florida and California. Strong job growth, increased foreign buyer activity and a growing Millennial population has helped push rents up in California, Charnoff explained. "Millennials want to remain mobile and don't know if they have economic stability yet. They may have to move relatively quickly and they've learned from the recent past that you can't necessarily sell your home as easily as you used to." While sharp rent increases can be tough on budgets, Charnoff said markets are just catching up from the Great Recession. "Rents were artificially depressed in those markets and are normalizing." He said homes undergoing a foreclosure were harder to rent out and often charged lower rates. Now, as more properties move through the system, investors can charge higher rents. People living in bedroom communities are also likely writing bigger monthly checks. "As cities start to expand further and workers move their families farther from cities, that is driving prices up."